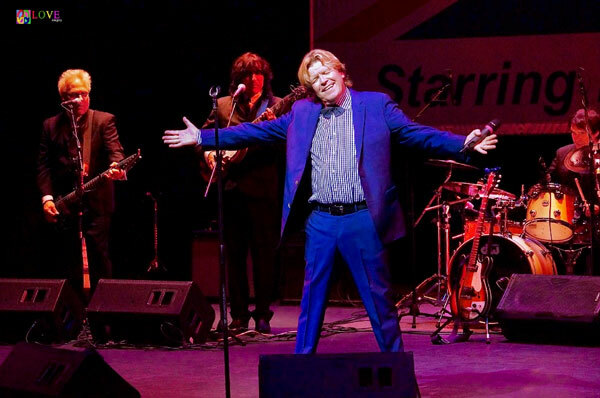 As we enter Toms River, NJ’s Grunin Center of the Arts lobby, we notice it’s already filling up with fans this Saturday Nov. 25, 2017 for the first of two shows by the legendary ’60s British pop sensation, Herman’s Hermits starring Peter Noone! Exclaims Joanne from Montvale, “The Noonatics are united — we follow our man!” before acknowledging she’s seen over 100 concerts by Herman’s Hermits starring Peter Noone. 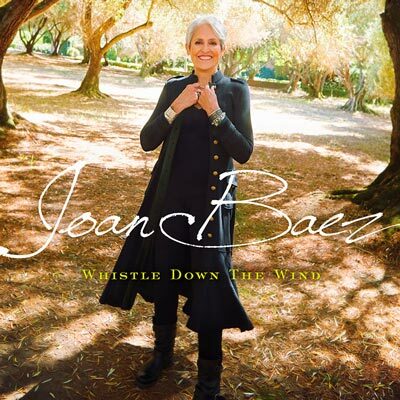 With her today, Joanne holds a copy of a special calendar created by fans to support Peter Noone’s favorite charity — The Unity Shoppe in Santa Barbara, CA — a year-round “free” grocery and clothing store which enables people in need to shop with dignity for basic life necessities including food and clothing. Every page of the calendar features a different fan-supplied photo of Peter, and each month, Joanne gets that month’s photo autographed by Noone. 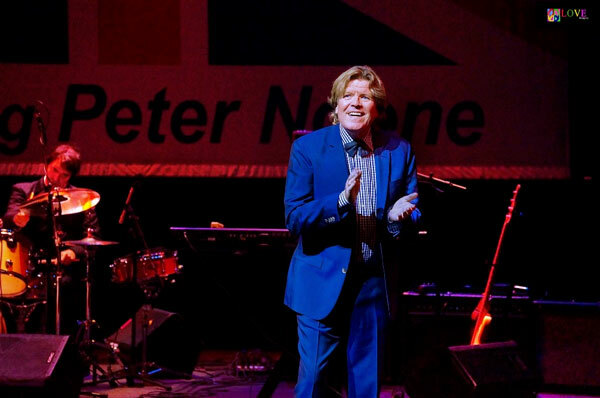 According to Stephanie, many of the Noonatics wear personalized buttons that say “Lifetime Member of the Peter Noone Fan Club.” Some also adorn their cars with British flags and special license plates and many even bring specific items with them to Noone’s concerts including glow sticks, British flags, Herman’s Hermits’ memorabilia, and more. Both Stephanie and Joanne say they’re looking forward to both the afternoon and evening performances today at the Grunin Center. Soon, along with the fans, we enter the Grunin Center auditorium — a cozy performance space featuring great views of the action from every seat. 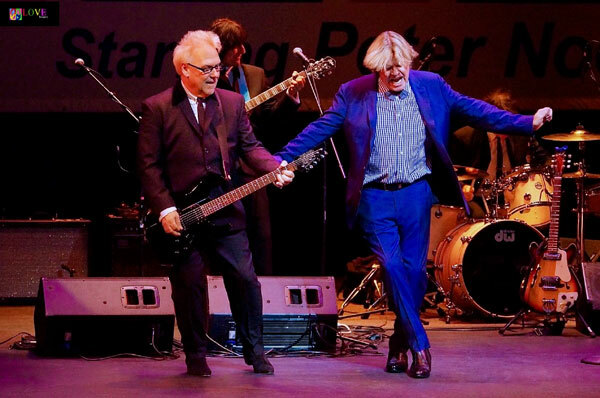 As pre-recorded marching music begins to play, the Noonatics in the house stand and wave their British flags and glow sticks while each of the Herman’s Hermits’ band members — Billy Sullivan and Vance Brescia on guitars, Rich Spina on keyboards/bass, and Dave Ferrara on drums — take the stage. 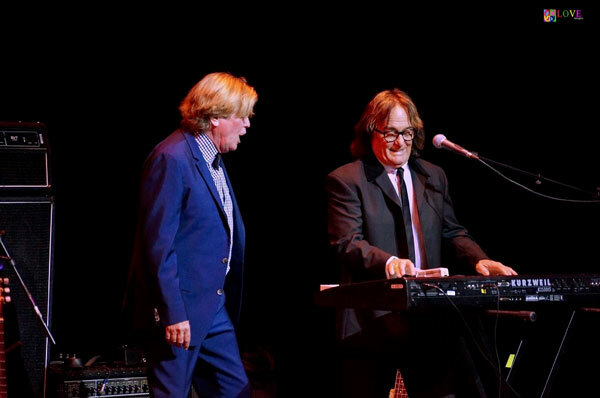 The audience claps along with the band members as they anxiously await the arrival of Peter Noone. Moments later, Noone makes his entrance with an enormous smile singing his 1964 Top 20 hit, “I’m Into Something Good,” encouraging the audience to clap along with him to the music. Moving on to a rockin’ rendition of The Clovers’ 1959 Lieber/Stoller smash, “Love Potion №9,” Peter holds his microphone out for the audience and they happily sing along with him. 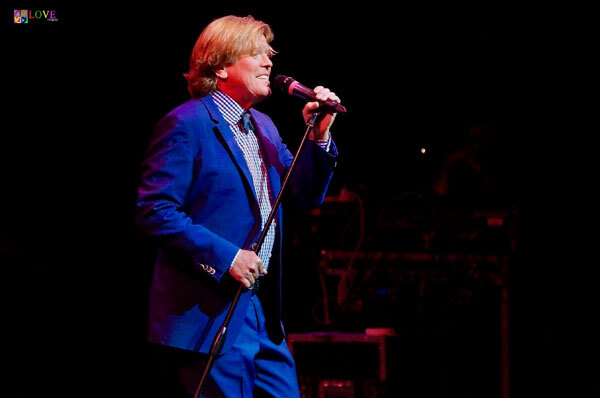 Following excited cheers, Noone comments, “When we were lads growing up in England, we dreamed of playing here in Toms River at the Grunin Center,” after which he dedicates the group’s next number — their 1966 Top 5 hit, “Dandy — to the Grunin Center’s namesakes, Jay and Linda Grunin. 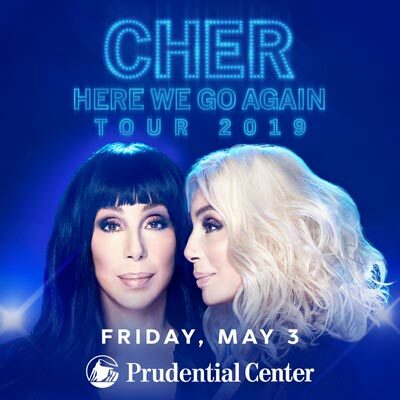 Quickly moving on to a rollicking rendition of Frankie Ford’s “Sea Cruise,” the audience sings and dances in the aisles while Noone and Hermits’ keyboardist Rich Spina have fun onstage. Guitars twanging, the group pays homage to another ’60s group, The Beatles, with a sparkling rendition of “All My Loving,” drummer Dave Ferrara’s head bopping to the beat a la Ringo Starr. Descending the stage stairs to stroll through the audience, Noone is given a handmade poster by a teenager featuring a picture of herself as a child with Peter. Labeled “Then and Now,” Peter thanks the young fan for the poster and, in exchange, gives her a current LP and a compact disc filled with Herman’s Hermits’ music. 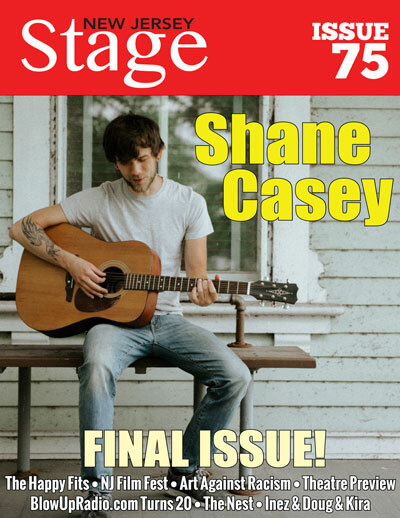 The crowd loving his quirky sense of humor, Noone quickly segues into his 1967 hit, “No Milk Today,” his guitar still in hand. Audience members stand and cheer for this emotional performance. Following up with his rockin’ 1965 hit, “Just a Little Bit Better,” Noone takes his place in between fellow band members Billy Sullivan and Vance Brescia on guitars to see Brescia high kick, much to Noone’s amusement. Glow sticks are waved back and forth as Noone and the Hermits perform their 1965 Top 5 remake of The Rays’ hit, “Silhouettes.” They follow that up with their 1966 #3 smash, “Listen People,” it’s “Everybody’s got to love somebody sometime” message clearly resonating with this Grunin Center crowd. 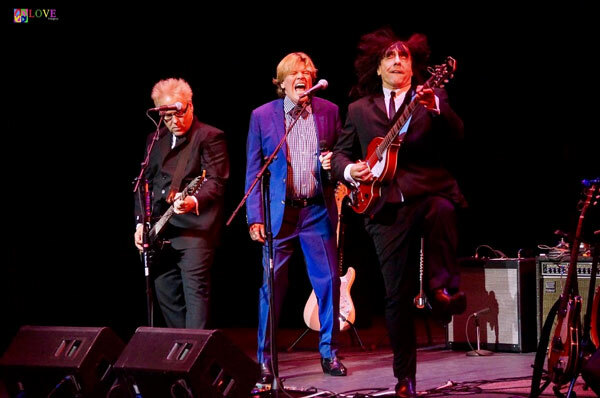 Following a standing ovation, the group performs a spirited version of their 1965 #2 Billboard hit, “Can’t You Hear My Heartbeat.” As Billy Sullivan and Noone dance around during the instrumental break, the Noonatics in the audience stand during the song to cheer them on. The entire crowd sings along on the group’s 1965 #1 smash, “Mrs. 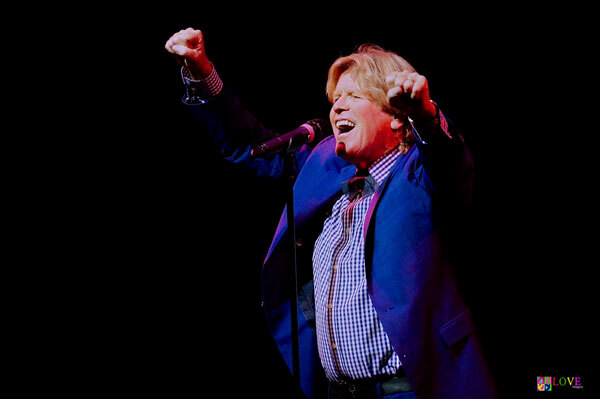 Brown You’ve Got a Lovely Daughter,” and they also join in on another 1965 Herman’s Hermits’ #1 hit, ”I’m Henry the VIII, I Am.” Creating a singing competition among various sections of the auditorium, Noone has the audience is on its feet by the end of this energetic number! To conclude the afternoon’s festivities, Noone and the Hermits entertain the crowd with their final number, a nostalgic rendition of their 1967 Top 5 recording, “There’s a Kind of Hush.” After singing along to this enjoyable feel-good tune, the audience rewards Noone and the Hermits with a final standing ovation! 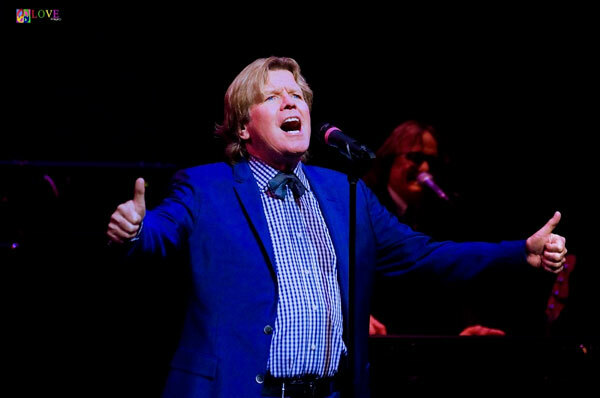 As audience members make their way out of the auditorium and back into the Grunin Center lobby, we chat with several from the crowd who comment on this afternoon’s performance by Herman’s Hermits starring Peter Noone. 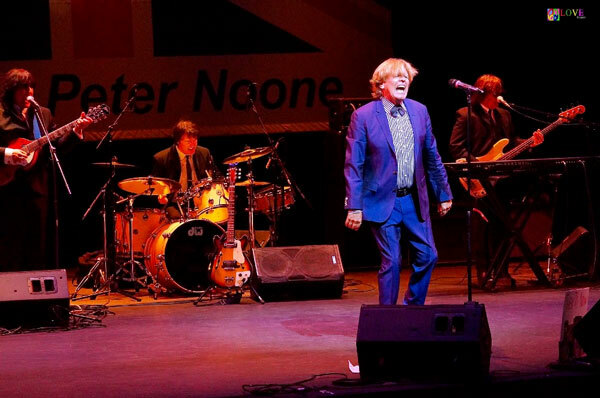 We also chat with a family who traveled from Pedricktown to see Peter Noone and Herman’s Hermits today. Daughter Jacalyn is the teenager who gave Peter the handmade poster during this afternoon’s performance. We additionally get a moment to chat with another family in the Grunin Center lobby. John from Tinton Falls tells us he brought his young daughter, Angela, to her first concert today because he knew it would be appropriate for her. Explains Dad, “Angela knew all the songs and sang along,” to which Angela replies with an energetic thumbs-up! 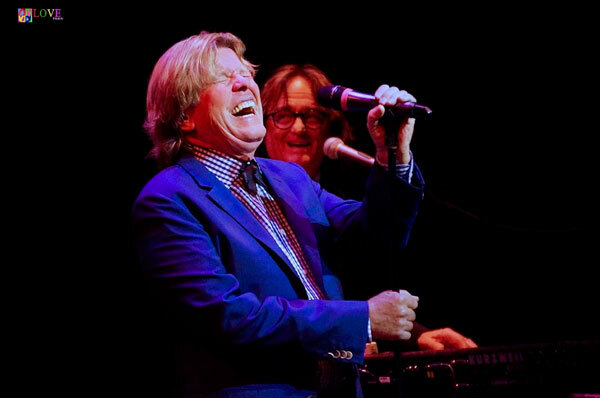 To learn more about Herman’s Hermits starring Peter Noone, please click on peternoone.com. 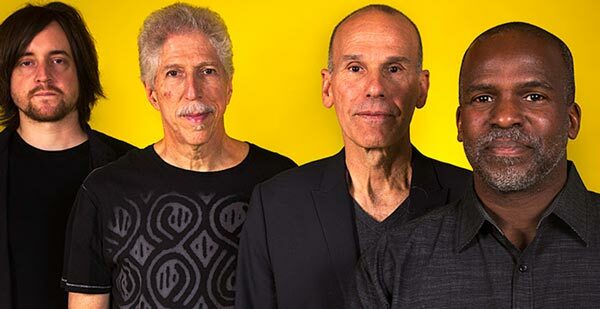 For information on upcoming programming at Toms River’s Grunin Center — including An Intimate Evening with Rickie Lee Jones on March 22, 2018, and Peter, Paul and Mary’s Peter Yarrow on May 11, 2018 — please go to grunincenter.org.